Pictured, first row, left to right: Samuel Reeves, Nicole Andrino, Alexsis Harris. 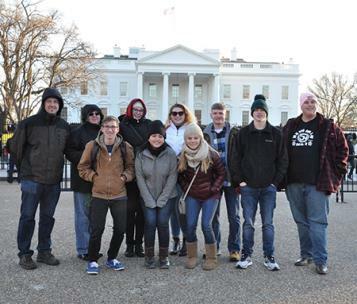 Back row, left to right: advisers Brian Gerber and Laurie Rowland,; students Samantha Benavides, Emilie Bryant, Cole Baxter, Braden Dills and Jared Boatfield. The Cleveland State Community College Speech and Debate Team competed at the Richard J. Ernst Invitational in Alexandria, Va. Team Members Jared Boatfield placed sixth in Individual Parliamentary debate. Samantha Benavides placed fifth and Nicole Andrino placed seventh in Extemporaneous Speaking. 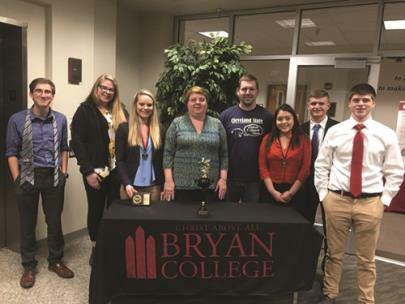 The CSCC Speech and Debate Team also participated in Bryan College's Lion's Pride Debate tournament this month. They placed first in the two-year college sweepstakes and Alexsis Harris and Nicole Andrino placed sixth in the Novice Division.